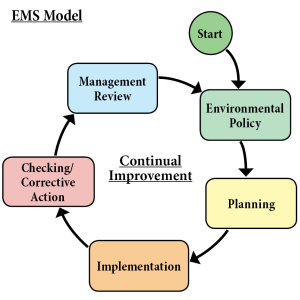 Environmental Management System Planning | D&B Engineers and Architects, P.C. Evaluation of multimedia compliance audit findings. Development of standard operating procedures. Regulatory compliance plans are roadmaps that identify required compliance activity, completion times, and affected media, e.g. air, water, solid waste, hazardous waste, etc. D&B performs meticulous evaluations of facility operations by conducting a new/updated audit or by reviewing results of a previous audit. D&B then creates an organization chart to identify individuals who will be assigned to and be responsible for maintaining compliance. Consistent external reporting, e.g. to regulatory agencies, is a critical measure of success. Internal reporting enables monitoring the effectiveness of the external reporting and “auditing” the accuracy of overall compliance over time. Management reporting allows for required changes to the EMS to be identified either due to operating changes or a modification of regulatory requirements. © 2014–2018 D&B Engineers and Architects, P.C. D&B Engineers and Architects, P.C.